The last thing I expected to be doing whilst in the Guatemalan highlands was meeting with a god, not even in Holy Week. My first thoughts were, which god? Being Easter and with the country in fervent celebrations my best guess was the Christian god, but what would an atheist know anyway. 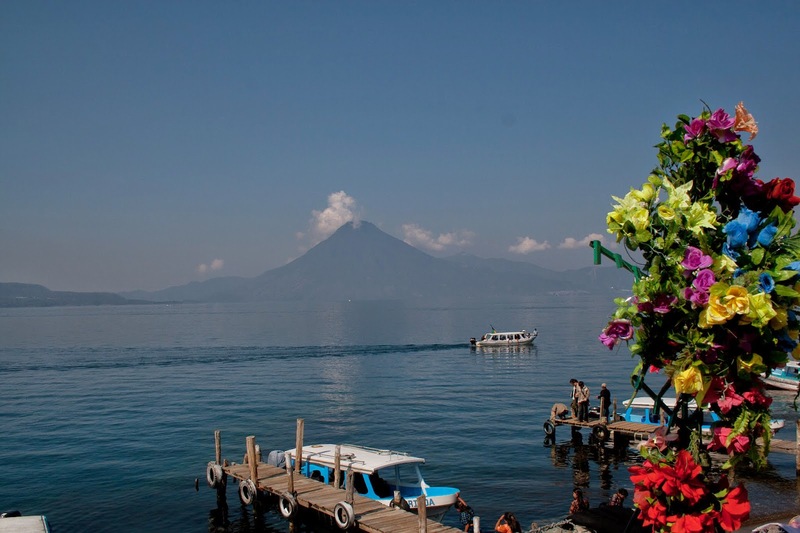 With absolutely no expectations, and no ascension required, we headed over the vast expanses of Lake Atitlan from Panajachel to Santiago Atitlan in our brightly coloured, slightly unstable motor boat. Surrounded by the ancient landscape of towering volcanoes some dormant, some not so dormant I had to wonder what could we possibly be going to see? When you have no expectations it is hard to be disappointed, but even if I was expecting god himself to be standing at the Pearly Guatemalan Gates I would still not have been disappointed with what we eventually found. My sense of excitement was heightened by the wind whipping, bone jarring, free-standing ride on the back of a utility vehicle taking us ever closer to our final destination. The sheer blood pumping thrill of racing along the dirt roads of a Guatemalan village many days from respectable medical care had me hoping there was a god at the end of all of this. And a god there was. Hidden away in nothing more than a shed at the back of a shanty house standing in a dirt covered, rubbish filled yard, looming in a dimly lit room filled with candles and the acrid scent of strong alcohol and cigar smoke was an effigy of Maximon. A blend of the Mayan god Mam and other more Spanish influences and surrounded by legends of baudy bed hopping, I can’t say I am any the wiser as to how Maximon became a god but I am not sure that was the point of the trip. As my eyes adjusted to the darkness I first realised I was about to catch alight as my lightweight travellers pants hovered over the open flame of one of the many candles on the floor. Crisis averted my attention turned to Maximon himself. Dozens of business like ties and scarves hid any form or shape except his carved wooden face. A black hat in the local style was atop his head and a cigar hung from his mouth, cigar removed you could pour liquor down Maximon’s throat which was conveniently collected via a tube into a container for later consumption. 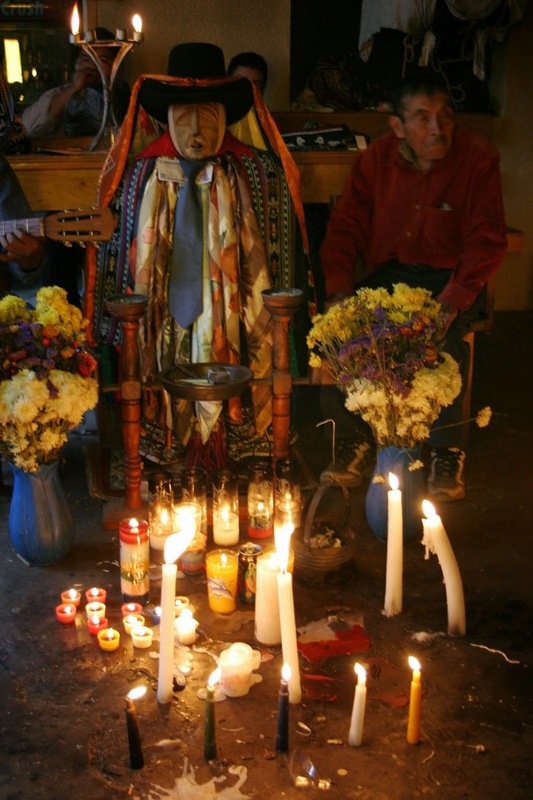 The two attendants shared their spirits with Maximon pouring a drink for him along with their own. Or more likely, (based on the fact that we made a monetary donation at the door) Maximon was sharing his spirits with the attendants. Their reverent faces were in stark contrast to the confused and slightly amused faces of myself and my fellow gringos peering through the haze the get a glimpse of a god. In the hazy gloom strange forms and shapes started to appear, there was a skeleton in a glass coffin. Real? I do not know, and later with the tricks time plays on memory I wonder if it was really there or if I conveniently slotted the macabre imagery into my memory. Offerings to the god were scattered on the floor dried flowers, money, cigarettes and alcohol. I can’t deny I wanted to partake in a drink with a god but it didn’t seem to be the done thing not being a local, so I abstained. What appeared to be gourds hung from the ceiling and christmas lights twinkled on the walls. It was a wild meeting of religion, vice and kitsch design. Worshipping (or gawking) over we respectfully departed the room and headed into the bright glare of daylight where I was left with the overwhelming feeling that I would consider religion as a viable option if only more of them involved Maximon.